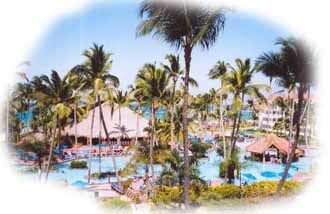 Breezes Resort Punta Cana is a HUGE 4 star resort (735 rooms). This is a family oriented resort that aggressively markets to singles as well – the result is a resort with tons of activities and tons of partying going on. 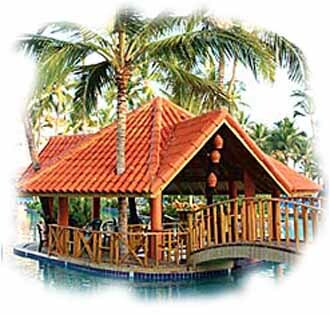 Breezes Punta Cana can be a great time for many, but if you’re looking for a quiet, romantic get-away – this isn’t it! The rooms at Breezes Resort Punta Cana look quite nice, but definitely need some updating. They are all air conditioned and have: safes; hair dryers; iron & ironing board; mini-bars and coffee makers. I never used the coffee maker – they make much better coffee at the bar (it’s worth the walk). Beds seem to be the same level of almost-comfortable that you get at every resort, the King beds are definitely better than the Doubles. This is an older hotel, facilities in the rooms can be hit or miss – some plugs don’t work low water pressure, etc. None of these ever bother us much as long as the room is laid out well and comfortable. Because of the humid climate in Punta Cana, if the AC isn’t working perfectly – the rooms tend to get a real musty smell. Ask to have your bedding changed if necessary. If the room is really unacceptable, ask to change rooms (they’ll accommodate you if there’s one available). The pool is probably the most striking feature at Breezes Resort Punta Cana – it’s an enormous meandering free-form pool with tons of lounge chairs around it and a swim-up bar (a resort pre-requisite for me). This swim-up bar is really cool; it’s an island in the middle of the pool with a bridge going over to it. There is also a separate kids’ pool adjacent to the main one that’s more fun for families and kids. The beach at Breezes Resort Punta Cana is also exceptional – really well manicured, beautiful white sand and more palapas than at most resorts. We spent most of our time on the beach. You will have to play the chair game at this resort though – get up early and reserve a chair (this happens everywhere, so “when in Rome”). The food is about the same as it is at most resorts in Punta Cana, you can always find something good to eat. There is one main buffet restaurant and a whole bunch of a la carte options. The a la carte restaurants cover several themes – Japanese, Italian, Dominican, French, Tex Mex, BBQ & Seafood (the Japanese, Italian and Seafood places were our favorites). Reservations are required for all of the themed restaurants and Breezes Resort Punta Cana has tried to fix the problem of getting these reservations by giving you three of them at random when you check in. This system is not good for everybody – if you don’t like the time or the restaurant you have to wait ‘til the day of the reservation and wait in line at the front desk to try to change it – a pain! Read my tips below for getting around the reservation problem. If you get off the plane with a load of people it’ll take you over an hour to get to Breezes Resort Punta Cana, they stop at every other hotel first. My advice is not to take the transfer – hire your own taxi and you’ll get to the resort and check in long before everyone else on your plane. Get the king rooms if you’re going as a couple, beds are way more comfy (real box spring instead of the cement pad under the Doubles). Pants are required for guys at all restaurants other than the buffet – bring a few pairs. You tend to get better food and service if you hit the restaurants when they open (try to get the first seating). Reservations: Method 1 – know the times and restaurants you want to go to before you get there. Slip the check-in clerk $10 and your reservation request while you’re checking in. Method 2 – someone always misses their reservation! Go to the restaurant you want ten minutes after the first seating and tip the Maitre D, they’ll usually find a table for you. If this doesn’t overload your moral barometer, it usually works.